I have been holding to this pic because I've seen it around and about on different blogs. After World War Two Saab were wondering what market to go into and decided to give cars a go. The result was some very cool, aerodynamic cars. I find it interesting two of the other main factors were front wheel drive and winter capability. I'm not sure those go together but maybe it meant it had a heater. To me this car could have been like the 2CV: unbreakable and wildly popular. The two cylinder 2-stroke motor developed a whopping 18HP and was mounted transversely. Not a speedster by any means it was driven a lot and covered thousands of miles in testing. 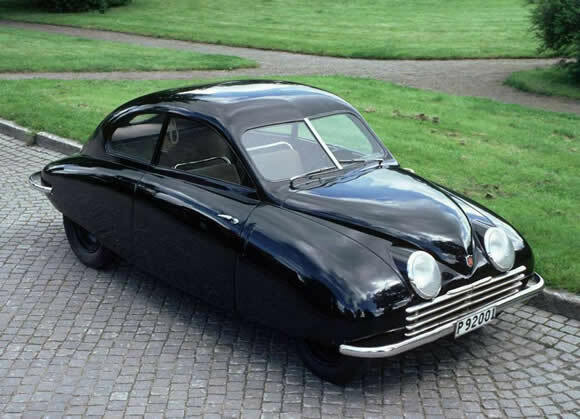 In fact Saab were so committed to testing their test cars covered approximately 530,000 miles (thats a few times around the world) before the final production models went into production in 1949. This is the beautiful start to Saab's automotive history. Read more about it here.